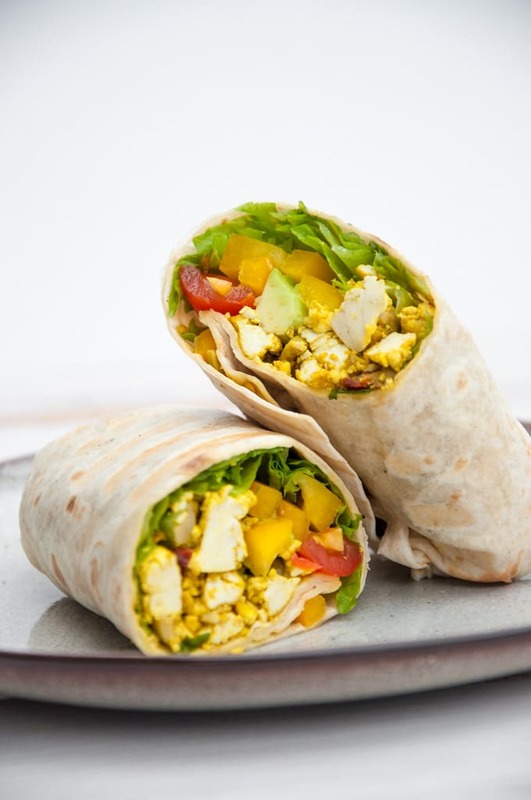 Recipe for a delicious Breakfast Burrito filled with Mediterranean tofu scramble, avocado, salad, tomatoes and bell pepper. It’s such a delicious and filling breakfast! Breakfast Burritos are one of my favorite breakfast/brunch recipes – everything you love for breakfast stuffed in a warm wheat tortilla. What could be better?! 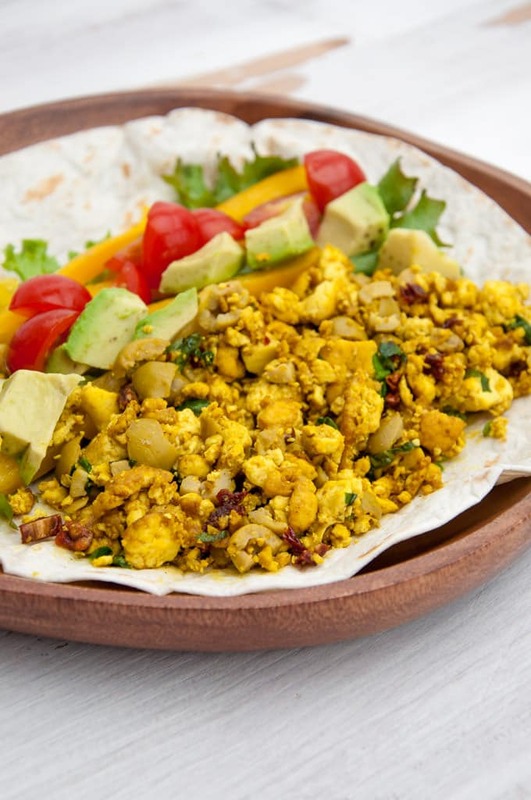 For this Breakfast Burrito, I’ve used my Mediterranean Tofu Scramble recipe. 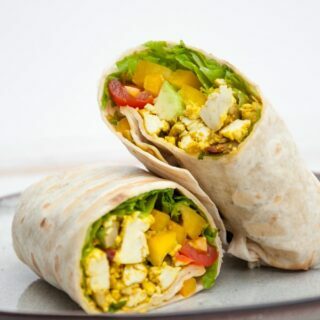 Of course, you could use a simple basic tofu scramble too, but I love the added saltiness of the sun-dried tomatoes and olives in this Burrito. It goes so well with the avocado, bell pepper, salad and cherry tomatoes. The key ingredient for the tofu scramble filling is KALA NAMAK. If you don’t have kala namak sitting in your spice cabinet already, I highly recommend getting Kala Namak asap. It is a Himalayan Black Salt and due to its high sulfur content, it’s perfect for all dishes that profit from an “eggy” taste and smell. And what would be a more perfect use for the salt than in tofu scramble? 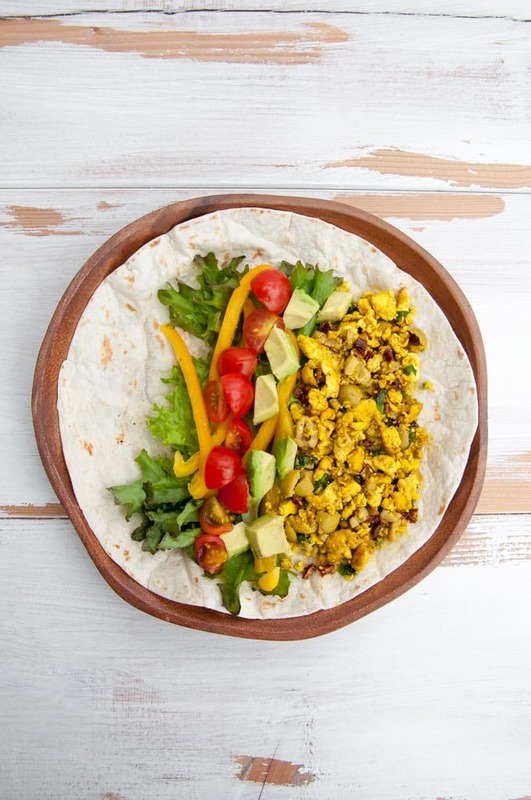 Recipe for a delicious Breakfast Burrito filled with Mediterranean Tofu Scramble, avocado, salad, tomatoes, and bell pepper. Add the curry powder, turmeric and kala namak. Mix well, so the tofu gets an even yellow color. Keep it on medium high heat while stirring for about 5 minutes. Add more kala namak or spices to taste. Add the small chopped sun-dried tomatoes, olives and basil to the pan, heat it for about 2-3 minutes until hot. Heat the tortillas in a pan until warm and soft. Assembly time! 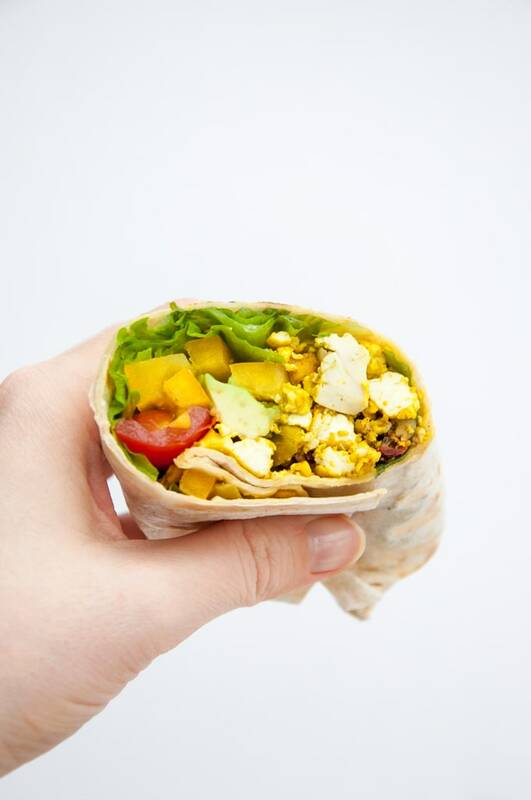 Place a few salad leaves on the tortilla, add the bell pepper, avocado cubes, halved cherry tomatoes and mediterranean tofu scramble. Fold in the sides and roll it in, then put it in an electric contact griller (or heat in a pan) to seal the edges. Cut in half & enjoy!